1886 Roanoke River Lighthouse — The Roanoke River Lighthouse restoration is nearing completion. The Lighthouse’s exterior has been restored and the lighthouse relocated over-the-water, within Edenton Harbor’s breakwater, just off of Colonial Park. The lighthouse, as it looked when completed in 1887, is called a screw-pile design because each piling was literally screwed into the river or sound bottom so they would not pull out in heavy storms. Edenton’s Roanoke River Lighthouse is the last extant example in the United States of a rectangular frame building built for a screw-pile base. The lighthouse was in commission from 1887 until 1941.The need for a lighthouse was recognized as early as 1835, when a ship was converted to a light station. The retrofitted ship apparently remained in place, where the Roanoke River meets Albemarle Sound, until it was scuttled during the Civil War in an attempt to make the waters more difficult for blockade runners to navigate. In 1866, to reinstate the light, a screw-pile lighthouse was erected but then destroyed by fire in 1885. An immediate effort to rebuild ended when the new construction was struck by ice during a storm and collapsed into the water. The present cottage-style building was erected on a screw-pile base at the location in 1887. The tower was fitted with a 4th order Fresnel lens. The current lens, on loan from the Town of Edenton, was made by E. Barbier and Co. of Paris. A private owner, Emmett Wiggins, moved the building (right) to his land at Edenton in 1955. It suffered significant damage from Hurricane Isabel in 2003. In 2007, the Edenton Historical Commission bought the Lighthouse for $225,000 and paid $75,000 to move it to Colonial Park in downtown Edenton’s waterfront. The NC Departments of Transportation and Cultural Resources agreed to restore the Lighthouse. The large Lighthouse bell, cast in 1901, by the McShane Foundry in Baltimore, was operated by a weighted mechanism much like that in a grandfather clock. Just think, if your grandfather clock has ever kept you awake, what would it be like to try to sleep with that large bell clanging day and night just outside your room. In May 2012, the Roanoke River Lighthouse was moved to it’s permanent home atop the pilings over-the-water, just off of Colonial Park at Edenton’s waterfront. If you were unable to watch the move, you can still come to see the progress as the walkway is added and the interior restoration begins. The Edenton Historical Commission is raising funds to furnish the Lighthouse as it would have been when the keeper kept watch. Your tax-deductible donation is needed to help furnish the Lighthouse when it is opened to the public. Furnishings, photos and stories are also needed. 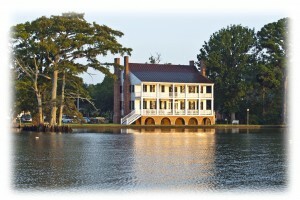 For more information on items needed, view the list at www.edentonlighthouse.org. 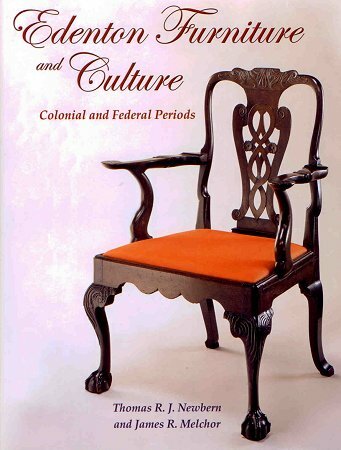 You can also see an exhibit in the Barker House Gallery of items which have been donated so far. WE NEED YOUR SUPPORT! 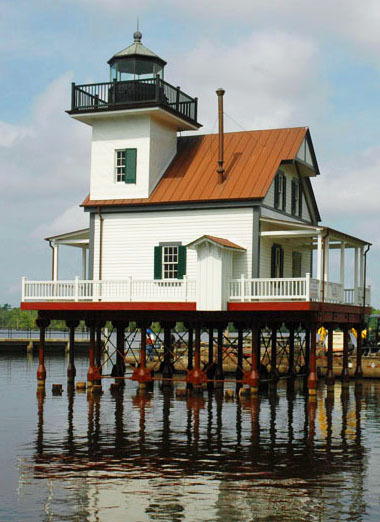 Please send your check to preserve this one-of-a-kind, original lighthouse, payable to the Edenton Historical Commission and mail c/o Lighthouse Fund, 505 S. Broad Street, Edenton, NC 27932. To see photos of the 2007 relocation of the Lighthouse to Colonial Park, see this Lighthouse Digest article. To watch a story of the 2012 move over-the-water, see TarheelTravelerreport. The 1886 Roanoke River Lighthouse is the last and grandest of fifteen screw-pile Light Stations on North Carolina sounds and rivers. On February 6, 1832, William Biddle Shepard (1799-1852) petitioned the U.S. House of Representatives for a light station to help sailors find safe entrance to the Roanoke River. In 1834, the U.S. Congress provided $10,000 to construct a light vessel at the mouth of the Roanoke River. A 125-ton, three-masted sailing ship was stationed across Albemarle Sound from Edenton Bay. Whale-oil lights covered with red, green and blue lenses, visible for 13 miles, hung 43 feet above the water. During the Civil War, the Confederacy controlled the light vessel, designated MM, until Union forces captured Plymouth in late March 1864. Trying to block the Union ironclad, Ram Albemarle, the Confederates scuttled the lightship 40 miles up the Roanoke River. In 1866, the government built a one-and-a-half story screw-pile lighthouse. Fueled by whale oil, it was first lit in January 1867. A fire damaged the structure in 1885. 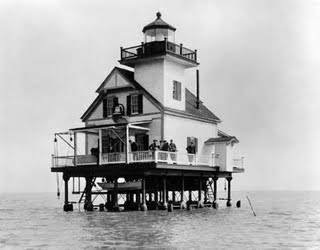 After ice on the Albemarle Sound cut the lighthouse’s pilings in February 1885, this two-and-a-half-story lighthouse was authorized in 1886 and built in 1887. The US Coast Guard deactivated the Lighthouse in 1941. In 1955, the Coast Guard sold this and two other surviving North Carolina sound lighthouses to Elijah Tate for $10 each. Tate (1902-1985), a Coinjock resident, was a former U.S. Lighthouse Service employee. While Tate was moving the Roanoke Marsh Lighthouse, the barge tipped and dumped that lighthouse. In rough weather on the Currituck Sound, Tate also lost the second lighthouse, which was probably the Wade Point Lighthouse. After this bad luck, Tate sold this 1886 Roanoke River Lighthouse to Emmett Wiggins (1921-1995) for $10. Because Wiggins had a marine salvage business, he may have attempted to move the first two lighthouses for Tate. Wiggins moved Tate’s third Lighthouse across Albemarle Sound to Edenton. 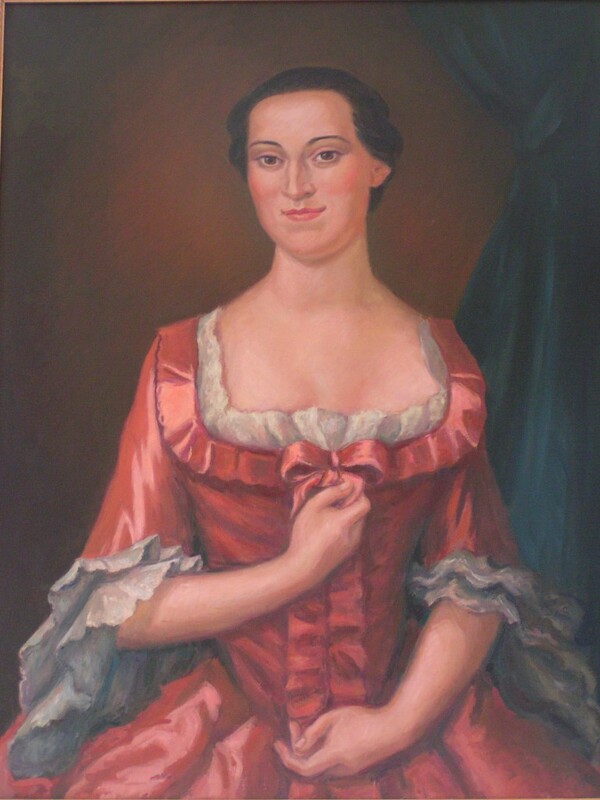 In 1946 Patsy Ann Chappell Brown (Miss Pattie), widow of M. G. Brown, sold him land at the mouth of Filberts Creek in the Albania neighborhood west of Edenton. Wiggins sank the Landing Craft Infantry (LCI) on which he had moved the Lighthouse and filled marshland around it with riprap. He lived in this Lighthouse until his death. Then add the obligation to carry fuel to the light every day, to get up and maintain the light periodically all night long, to listen to the large bell clanging incessantly in foul weather and to provide home schooling long before it was fashionable. At right, you can see the fourth degree (order) Fresnel lens of the Roanoke River Lighthouse before it was removed for safe storage pending relocation and renovation of the lighthouse. Think of the challenges: you live in a small wooden house, situated fifteen or so feet above the water, no yard or trees for shade, your transportation is a small row boat and your family shares the space, 24-7 (all day every day). Edenton’s Roanoke River Lighthouse was the home of just such a family and will be ready for tours after the renovations are completed. Those were just a few of the circumstances lighthouse keepers and their families faced every day. In the earliest days of the lighthouse service, families did live with the keeper in the house. Later, as transportation improved, families stayed ashore and the keeper shared the on-site duties with colleagues. Stories about life as a lighthouse-keeper family are not well documented, but the Edenton Historical Commission hopes to remedy that in time. Grandchildren of keepers are full of tales such as this. One lighthouse keeper of a similar screw-pile lighthouse, whose wife had recently given birth aboard the lighthouse, had a daily need for fresh milk. He went ashore, purchased a cow, managed to get it aboard his small row boat, rowed to the lighthouse and managed to get the cow from the boat onto a small platform he’s constructed below the small frame house. For months, he’d solved the need for fresh milk and kept his family together, but grossly added to his daily obligations as he made numerous trips ashore to obtain hay for the cow. Think of the fun all must have had when the storms arrived. Other keepers are reported to have kept chickens in the house. More interesting stories about lighthouse life can be found here.